It's time to place your votes for your favourites in the paper crafting community for the British Craft Awards 2018. Stampin' Up! 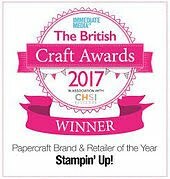 is once again nominated in the two categories it won in 2017, best Brand and Retailer and you may spot some of your other paper crafting favourites amongst nominees in the various categories. Voting also gives you a chance to win some Amazon vouchers so why not have your two penneth and cast your votes?